Principal Cast : Nicolas Cage, Andrea Riseborough, Linus Roache, Bill Duke, Richard Brake, Ned Dennehy, Olwen Fouere, Hayley Saywell, Lane Pillet, Clement Baronnet, Alexis Julemont, Stephan Fraser. Synopsis: The Shadow Mountains, California, 1983: Red Miller, a broken and haunted man, hunts an unhinged religious sect who slaughtered the love of his life. Those venturing into Panos Cosmatos’ LSD-infused bonkers batshit crazy Mandy will either delight in its corpulent violence and insanity, or come away utterly bereft of dignity. A splatter exploitation film wrapped in the techniques modern cinema offers filmmakers today, Cosmatos’ visceral, saturated aesthetic and Nicolas Cage’s full-bore performance (can you say “going full Cage”?) is a jigsaw puzzle of perfection, the perfect meshing of performance and role, as the actor slashes and hacks his way through a story of vengeance and brutality the likes of which we’ve not seen in recent times. 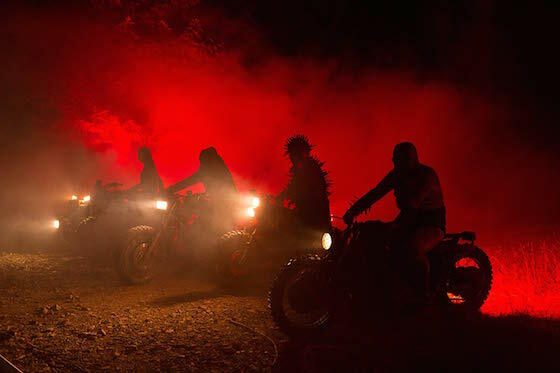 The film is a death metal chant to terror, the kind of fever dream Rob Zombie desperately wishes he could manifest on the screen, an 80’s-set Mad Max Thunderdome of gore and primal rage screaming beyond the screen to unleash itself upon the viewer. Those with weak stomachs should approach with caution. Everyone else? Dive right in. The backwoods of California, the mid 1980’s. A recovering alcoholic, Red (Nicolas Cage – Ghost Rider) and his lover Mandy Bloom (Andrea Riseborough – Oblivion) live a rural life isolated and at peace. One night, Mandy is kidnapped by a satanic cult, led by one Jeremiah Sand (Linus Roache – Batman Begins), who wants to use her as one of his concubines. When she belittles him, he has her incinerated in front of a wounded and desolate Red. When Red awakes from his unconscious state the next day, filled with rage and revenge he meets up with a friend, Caruthers (Bill Duke – Predator), arms himself, and begins to track down those who killed the love of his life. 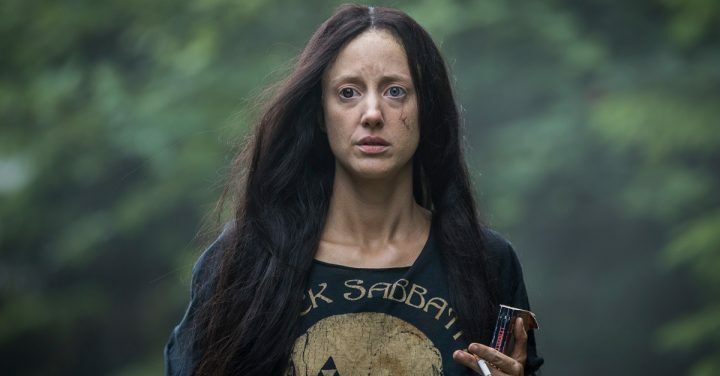 Look, it’s hard to recommend Mandy on any level aside from that of just out-and-out nuttiness. 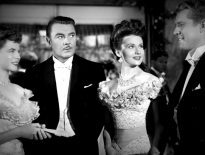 It’s not a film easily dissected in any normal measurable sense. Off-the-wall photography, bizarre narrative tone and with gratuity to spare, there are very few modern films with which to equate the sublime brilliance of Mandy’s glorious decadence. You’ll either get it, or you wont: Mandy isn’t a film with easy middle ground. Although at its heart it’s essentially an old-style exploitative revenge flick, Cosmatos’ cataclysmic visual tenacity and retro style mix perfectly to create a movie of such unique and unbridled vision, it’s reminiscent of the best of Argento or Cronenberg for sheer persistence of vision. Written by Cosmatos (son of Tombstone director George P Cosmatos) and Aaron Stewart-Ahn, the film leans heavily into psychological unevenness, a sense of unnerving fantastical nightmare fuel, delivered through brilliant primary colours and a palette of extraordinary 80’s grain and stock. The script is filled with high hokum verbosity at times, particularly when Linus Roache’s sadistic cult leader Jeremiah Sand gets going, but this matters little when it’s a film depending almost entirely on its imagery to deliver the shock and awe. The characters are formulaic at their heart, driven more by performance than depth of development, so don’t go into this expecting Oscar-calibre writing. The film borrows its sense of depravity from the likes of Deliverance or Texas Chainsaw Massacre, mixes in a load of drug-fuelled insanity and absolutely goes for broke with its high-octane final act of terror. Any good revenge film needs one essential ingredient to work. If the ingredient doesn’t work well, the film quickly falls apart. That ingredient? Motivation. The protagonist needs some kind of spurring motivator to propel him or her into action. In the case of Mandy, it’s the murder of Mandy that sparks Nic Cage’s battered old man into white-hot action. The film gives us the affection at first, their sense of companionship, before tearing through that like a knife through butter and sending Cage’s Red into a spiral of vengeance. The motivation is pure and simple revenge, the withering fire of which can only be quenched through total and utter extermination of all those who wronged him. Cosmatos makes no light work if this either, with Red going to hell and back in his quest of redemption. He’s no Liam Neeson in Taken, brutally carving his way through a litany of henchmen and acolytes. Rather, he’s an Everyman spurred on by anguish, adrenalized focus his transport, and the outcome is always, always in doubt. Cage, for his part, delivers a performance like only the Mad One can deliver, a decade of direct-to-DVD wilderness schlock honing the perfect overacting style to make this role, in this film, work. It’s deliberate and calculated on Cosmatos’ part too, to give Cage this role, but his one-trick character personifies the style Cage has delivered since his Leaving Las Vegas days. 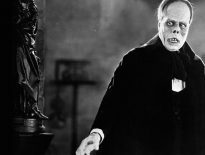 He spends the film mostly in tortured agony, covered in blood and bile, goggle-eyed crazy to the point of hilarity. But there’s a nuance to his role (if you can believe it in a film where he literally fight demon bikers from hell) that manifests as believable, if not entirely fantastical. Cage’s support in Riseborough, Roache, Duke and the grab-bag of secondary characters – most of whom are all slaughtered during the gripping, razor-wire finale – all do good work (Roache especially gives a… er… ahem, revealing performance) but they’re only there as structural ballast to Cage’s over-the-top performance here. It’s his film, he knows it, and he wants to make sure you know it too. Where I think Mandy works best is with its atypical subgenre style. As mentioned, the film is a nightmare tableau, replete with a discordant soundtrack (by the late, great Johann Johannsson) and Benjamin Loeb’s off-kilter cinematography. The first half of the film is a bewildering dreamscape of over-saturated technicolor, anamorphically distorted esoteric beauty juiced up on bucolic isolation. The second half of the film is your more traditionally lensed horror film, deep blacks and undercranked action footage bathing the heady violence in a creepy, insidious glory. 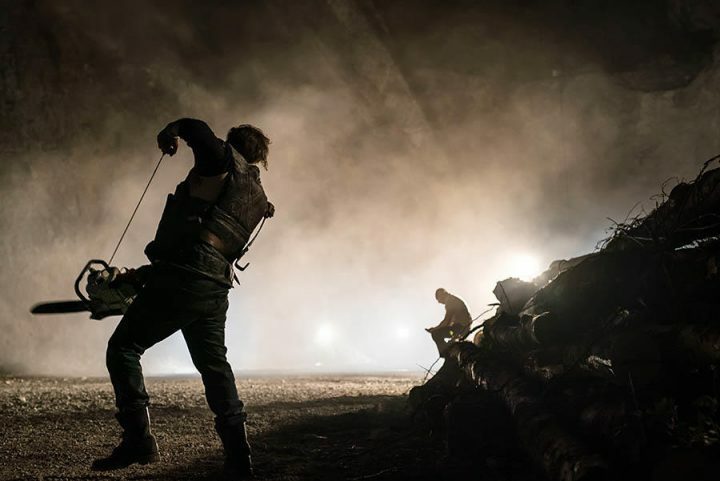 One wouldn’t call Mandy a beautiful film in the normal sense, but the effectiveness of Loeb’s unique and stylish cinematography cannot be understated with regards to its impact on the story. Johannsson’s musical accompaniment – this was his final film before his unfortunate passing in February – is both eerie and subtle as required, although hitting solid notes of ravaging violence where needed. There’s a vast 80’s vibe to his work here, an inimitable talent for beauty within madness an orchestral feat that needs to be heard as loud as you possibly can. Mandy is a film almost defying rationalisation. In many ways, it’s an experiential film, similar to that of Kubrick or Malick, where you don’t engage with it in an intellectual manner more than you do an emotional level. Mandy’s a film about revenge, pure and simple, its themes and motivational trajectory aimed squarely at the visceral feelings of righting a horrific wrong. There’s no denying the sheer brutality at work here, and Cosmatos’ film almost – almost – feels pornographic in this sense of achievement. Glorifying the violence is justified only through the film’s motivation, and that motivation is significant enough to warrant such carnage. That, and Cage’s absolutely bonkers performance. A heady, malevolent, incredibly stylish manifesto of violence and depravity, Panos Cosmatos’ Mandy is a hell of a wild ride and an absolute classic of the subgenre that works whether you think it does or not.